Hedy Lamarr was an Austrian-born American inventor and film actress. At the beginning of WWII, Lamarr and Gorge Antheil, a composer, developed a radio guidance system for Allied torpedoes which used frequency hopping and spread spectrum technology to defeat the threat of blocking or interfering with authorized wireless communication the Axis powers. The US Navy did not use the technology before the 1960s, although the principles of this work are incorporated into Bluetooth, GPS, and Wi-Fi- technology. In 1996, Lamarr, at 82, was awarded the Sixth Annual Pioneer Award of the Electronic Frontier Foundation. Ada Lovelace (née Byron - yes, as in Lord Byron, her father! ), was an English writer and mathematician known mostly her work on Analytical Engine, Charles Babbage's proposed mechanical general-purpose computer. Lovelace was the first to see that the machine had possibilities beyond pure calculation, and published the first algorithm for such a machine. 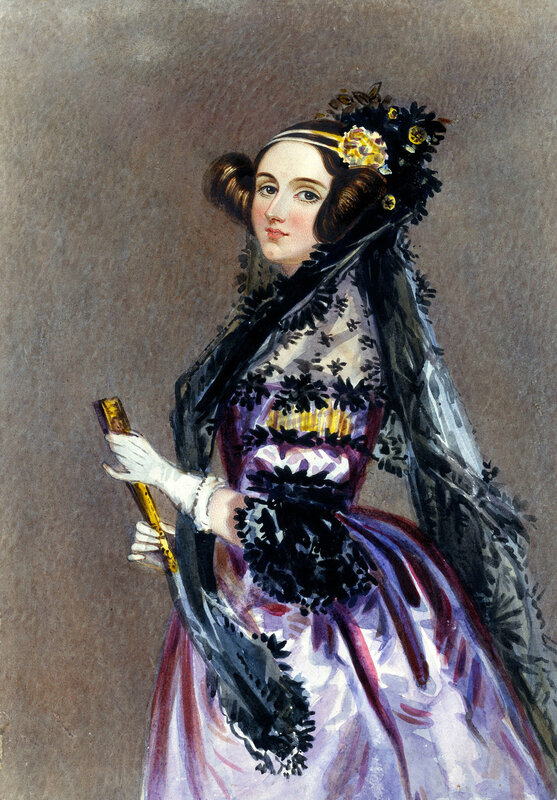 She is regarded as the first person to recognize the full potential of a "computing machine" and she is seen as the first computer programmer. Ada Lovelace was a prophet of the computer age! Caroline Herschel was the first woman to receive full, honest recognition in the field of astronomy. Caroline ran her brother's household, performed as a concert singer, and helped her brother create reflecting telescopes. She learned algebra, calculations & conversion formulas, and astronomical theory to better be able to observe the stars and was the first woman who received a salary for scientific work. Caroline went on to discover eight comets. She calculated, wrote papers, compiled supplemental catalogues to Flamsteeds Atlas. She was awarded numerous honors and prizes such as a gold medal of the Royal Astronomical Society. Marie Curie was the first woman to win a Nobel Prize (hers was in Physics), and with her later win, (this time in Chemistry), she became the first person to receive Nobel honors twice. Henri Becquerel's discovery of radioactivity in 1896 inspired the Curies (Marie and her husband) in their brilliant research which led to the isolation of polonium and radium. From 1898 until 1902, the Curies published around 32 scientific papers, some of which gave a detailed account of their work on radioactivity. In one of these papers that they reported that the tumor-forming cells were destroyed faster than healthy cells when exposed to radioactivity. During World War l, Marie Curie helped out by using portable X-ray machines, which gave soldiers immediate attention on the battlefield. Over one million wounded soldiers were treated with her x-ray units. Curie was also the one responsible for coining the term radioactivity and theorizing the concept. Jane Cooke Wright was a surgeon and pioneering cancer researcher who is famous for her contributions to chemotherapy. She was also one of the first African American graduates from Harvard Medical school and by 1967, she was the highest-ranking African American woman in a US medical institution. She developed a technique of using human tissue culture rather than laboratory mice to test potential drug effects on cancer cells, developed new chemotherapy techniques, and introduced the use of methotrexate to treat skin and breast cancer. Wright also implemented a pioneering program to study heart disease, stroke, and cancer. Her chemotherapy methods spurred research and treatment implementation around the world. Jane Goodall is a British anthropologist and primatologist. She is considered to be the world's foremost expert on chimpanzees and is famous for her 55-year study of family and social interactions of wild chimpanzees. Jane Goodall was born in London in 1934. In 1960, she went to Tanzania to begin her study of wild chimpanzees. Her immersion into their lives, bypassing rigid procedures, lead to new discoveries of primate behavior that shape scientific discourse to this day. Goodall discovered that chimpanzees have a complex social system, use a primitive "language", make tools, throw stones as weapons, and use embrace and touch to comfort one another and develop familial bonds. Jane Goodall has worked considerably on conservation and animal welfare issues and advocates for environmental preservation. Valentina Tereshkova is a retired Russian cosmonaut engineer. She is the first woman to have flown in space, and she remains the only woman ever to have been on a solo space mission. Despite the success of her mission, it was 19 years before another woman (Svetlana Savitskaya, also from the USSR) traveled to space. Before becoming a cosmonaut, Tereshkova was a textile factory worker and an amateur skydiver. With Tereshkova's single flight, she logged more flight time than all the American astronauts before that date combined. While in flight, she maintained a log and took photographs of the horizon which were used to identify aerosol layers within the atmosphere. Rosalind Franklin was a chemist who discovered the structure of DNA. The photo which was critical evidence in identifying the structure of the DNA was acquired through 100 hours of X-ray exposure, done of a machine Franklin herself had perfected. As it so often happens, Franklin's conflict with a colleague ended up in unauthorized disclosure of her work to competing scientists. Two male scientists Watson and Crick took credit for her discovery - and won the Nobel Prize for it. Margaret Reed Lewis was an American cell biologist and embryologist who made great contributions to cell culture techniques and cancer research. She was the first person to successfully grow mammal tissue in vitro, using a specific salt solution she developed herself. She was an authority on tumors and pushed cancer research forward. Being a female scientist in the early 20th century, Lewis was not capable of promoting her own work and achievements, although with her husband's help (he was her work partner), she was able to develop tissue culturing techniques further and research how single cells impacted the organism as a whole. Rachel Carson was an American conservationist, marine biologist, and author whose book Silent Spring advanced the global environmental movement. In the 1950s, Carson began giving most of her attention to conservation, especially to problems which she believed were caused by synthetic pesticides. This resulted in Silent Spring which shed light on environmental concerns to the American people. Silent Spring was met with strong opposition by chemical companies (obviously), inspired a reversal in the national pesticide policy, and led to a nationwide ban on many harmful pesticides. It also led to the creation of the U.S. Environmental Protection Agency!